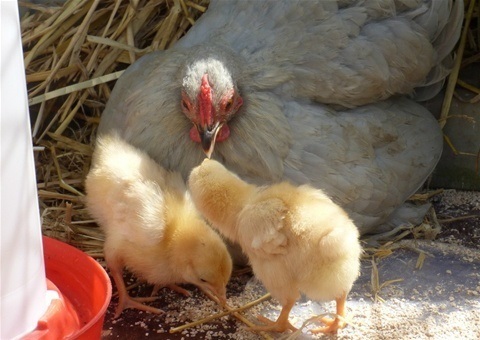 This is the first picture of Twilight and her adopted chicks. Thank heavens, she liked the look of them and instantly took them under her wings...literally! I went anxiously down the garden at daylight to take a peep at them. At first, all I could see when I opened the side door was a puffed up Twilight. Her blue-grey wings stretched out like tiny arms and on closer inspection, two tiny yellow heads peeped out at me. I sighed with relief! Despite the early hour, I encouraged them to come out and have some food and water. It’s amazing watching mother hens (even surrogate ones) teach their young how to eat food. Twilight made some exaggerated pecks at the ‘baby chick food’ which she never liked herself, and the young copied. However, they already had a head start in their last home so it came a bit easier. Then with a sweep of her wing, she ushered them back into the nest where they stayed until the sun was properly up. What a wonderful day.